"I smell new pups, as I'm not gonna care for them or anything, I'd rather not be around them... that's all," Yagami said with a bored expression. I was shocked. "Just beacause pups are around doesn't mean you have to care for them. Or help out in their growth." I explained. "Ylva and I watch them, I hunt so Ylva can feed them. Once they are older I'll have a hunter if they so chose teach them to hunt or I'll do it. A warrior teach them fighting tactics. Its more of a volunteer thing, not a requierment"
"In my clan, it's either care for the pups during their early days, or don't bother being around. I follow the codes from then still, I mustn't be around if I don't wish to care. I don't care what their names are, if they live, what colours they are, or anything of them for that matter. I'd rather die than know anything about them or meet them." I felt a sudden rush of anger, but tried to maintain my composure. 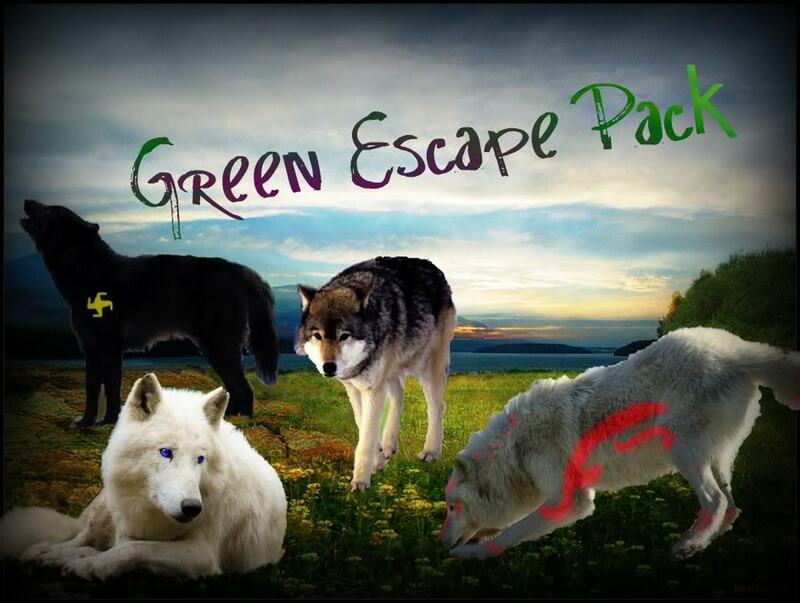 "Well, this is our pack, not a clan. The same doesn't follow, you don't have to meet them, know them or anythnig. Just it bothers me that your never around. 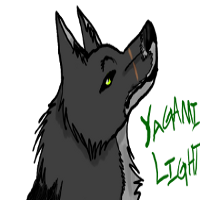 Ylva and I have started to think on a Beta since the pack is going well, and this isn't the way to get it" I said, trying to disguise the anger in my voice. "I don't feel like I should be around just yet. I'm not hanging around any pups, they will bother me anyways. Not unless you want me to injure them, I won't hang around much unless they die or something. Besides, my den is right here." I was yelling now, "They are in the den at all times. You so much as touch them with hurtful intentions I'll rip your throat out. Why did you even join a pack if you won't be apart of it?" I stood, my muscles tense. "Is a throat so easy to rip out? If they so much as touch me, I'll break their weak spines... cha!" He was grinning now, why? He was excited, still, almost no emotion was in his voice. "I never said it was, but with the right motovating factors, it becomes easier. Why do you hate pups so? They are harmless, what do any pups do to deserve hate? Not just these, but all." I growled, my anger intensifying. "I don't hate them, I don't like them, though. I dislike having to do with them. If they touch me, I will harm them deeply. It's not my fault I would talk big like killing something... it's a trait of my clan. I'm far too careless anyways, if I had a choice to kill a pup or sire one, I'd choose to kill it most likely." I was seeming with anger now. "You don't have to like, care, do anything with them. You harm them in any way, you will have a bitter punishment." I growled. I looked up and tried channeling my anger, but nothing came of it. "I just came to tell you to stop avoiding everyone, trying to give you a chance at becoming beta, is all"
"I'll wait a while until I return. I will be moving my homing area a bit closer, not this far away, but a bit closer... then gradually getting closer." "You don't have forever. Beta is going to be chosen soon." I said, a slight growl still evident in my voice. I turned for a breif second and realized why I never saw anything of me channeling my anger. A small forest fire had started, not to far. "Oh god, what have I done now?" I asked myself. "Its far enough away that if it doesn't spread far, it will cause no harm, not to the den area at least. I can't say the same for your little den. I may be able to help with rain, but not much"
"Not a permanent den, not a problem. I was just about to move a bit closer anyways. Maybe about a kilometer, or hectometer away." I tilted my head in confusion, but soon regained my thought and caused a heavy rain to start fall. "It may not last since no emotion caused it, just pure will." I said, looking back at the fire. "A kilometer is roughly a mile... a hectometer is a bit less, just a heads-up." Ylva wakes up and yawns smiling at her pups still asleep. I nodded, still watching the fire. The flames dimmed but where still strong. "The ground should for sure be soft enough to dig" I tried to joke, hopen to lighten the mood. Yagami grabbed his kill and grunted. "I'm movin'." Ylva gets up sees Aleena wake up and licks her. "I'd say you have no choice" I said seeing the fire spark, catching more woodland on fire. I ran ahead to the den and walked in, shaking my wet fur. I laid down in a seperate chamber, near the entrance. The male covered his old den's entrance with dirt, lots of dirt and stone. He darted off, stopping between a kilometer and hectometer away from the main den, he began digging into a tree's roots. I looked around and saw Koby nearing the den entrance. I quickly grabbed him, taking him back to Ylva. "Better be more careful." I grunted, my sour mood back. Ylva looks at Fenris " whats a matter?' she says licking him. I pulled away, "Nothing," I muttered. Ylva laughs as Violet gets on her head.